"This is my balance sheet. It tells me what kind of art I like." 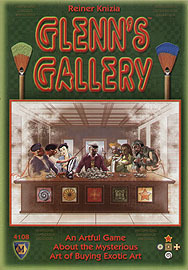 You work for Glenn's Gallery. Your job is to look at art trends and predict the number of customers for different types of art. Each turn, you assess information about this month's buyers. However, you must also watch out for art students, who drive away paying customers! At the end of each month, Glenn weighs your recommendations against his customers' choices. If you're clever, Glenn rewards you... But if you fail, you may find your cherished pen replaced by a broom.